Not unlike the one other piece of W.W. II historic fiction posted on this site, the attached short story is remarkably brief and to the point. Published weeks before America committed itself to the war, this tight little ditty was penned by Pat Frank (born Harry Hart Frank: 1908 – 1964) who wished to convey the inherit dangers of allowing the Nazi-sympathizing German American Bund to operate unchecked in the land of the free and home of the brave. As you might have guessed by the images posted above, the fictional German boy who lives in the U.S. and is the subject of this story, had his thinking coerced by other U.S.-based Germans. 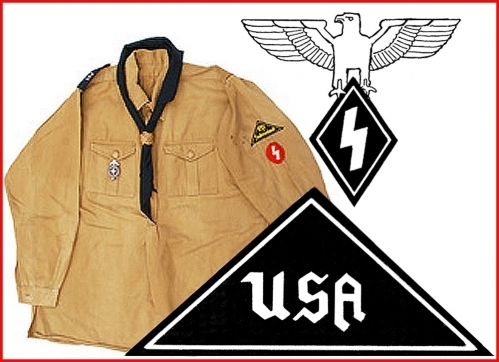 Although it is not terribly clear which organization did the brain-washing, it could have been a small American branch of the Hitler Youth; above you will see the uniform shirt the boys wore along with two elements of insignia relegated to the American branch of the organization. The other short story is called NESEI HOMECOMING.